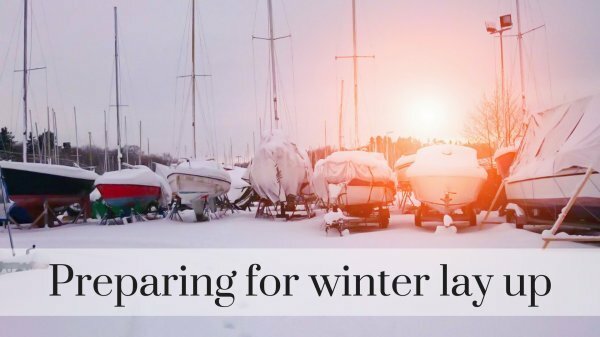 If your vessel is likely to be out of commission for the winter, or for any prolonged period of time, taking steps to prepare the boat could help prevent or minimise problems either during a prolonged cold snap or when putting the boat back into commission. There is plenty of advice available on the internet, much of which probably already forms part of your routine engine maintenance program, but topping up diesel tanks, changing the oil, draining and refilling cooling water/anti-freeze and preventing condensation build up by blocking exhaust outlets are just some of the steps you can take to properly prepare your boat. While you are about it, consider draining down fresh water tanks and other ancillary services which are at risk of freezing. Remove sails (bagged and hung upside down to prevent rodent damage), charts, hand held electronics, running rigging, blocks etc. Spars should either be removed and stored ashore under cover or covered up if left onboard to minimise weathering. Boat covers should be attached securely but allowing for air to circulate and positioned so that water runs off easily. Prop up bunk cushions and open locker lids, lockers, doors, fridge doors etc. to encourage as much ventilation and air circulation as possible. Linen, blankets, clothing etc. should be stored ashore to minimise the risk of mould. If you would like to receive future newsletters please fill in the "Keep in Touch" form at the bottom of our website.